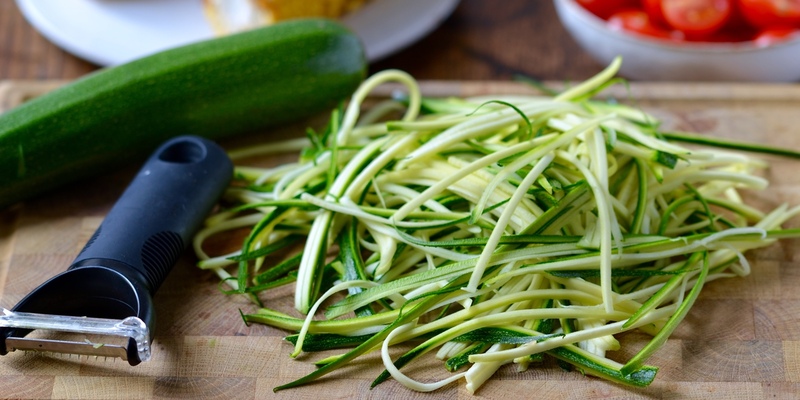 Courgetti, also known as courgette spaghetti or zoodles in the US, refers to courgette that has been cut into ribbons using a spiralizer, julienne peeler or sharp knife. Offering a similar texture to spaghetti, it provides a healthy alternative to pasta with significantly fewer calories. As the ribbons are made simply from courgette they are also gluten and dairy free, making them an ideal vegan substitution to egg-based pastas. For a quick and healthy dinner recipe try Monica Shaw's Garlic chilli prawns with carrot and courgette, with the vegetables taking the place of noodles. Emma Potts' Courgetti salad with tomatoes, grilled corn and herb dressing is a wonderfully fresh summer supper, while Robert Thompson's Pan-fried red mullet on courgette tagliatelle is a stunning, elegant courgetti recipe suitable for dinner parties.